Do you ever have a thought or idea and then just, forget about it? 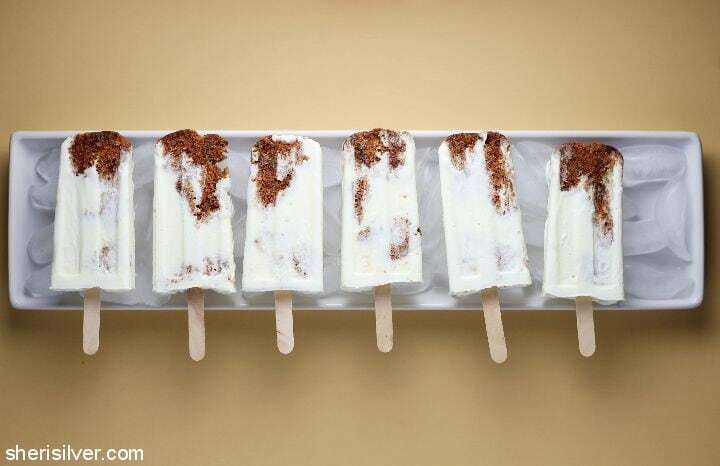 I had the notion, a while back, of creating a carrot cake popsicle. It went no further than the “notion”. 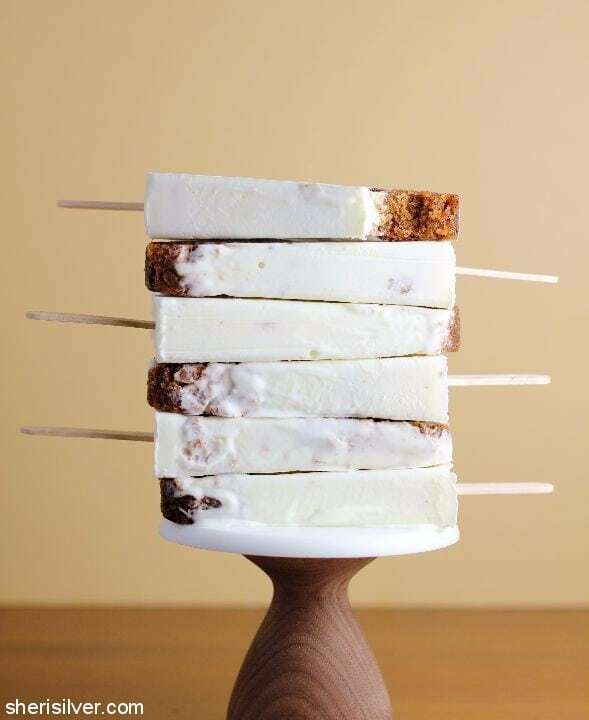 And then the astoundingly talented Steph of i am a food blog posted her version on Wit and Vinegar’s Popsicle Week 2017 (you can find the link, along with all of the other pops, here). Steph did a cream cheese pudding base, but we all know how I feel about pudding. So I decided to do more of a cheesecake base, to mimic the cream cheese frosting that – TBH – is the real star of any carrot cake, right? So now I had my base; all I needed was the carrot cake. I didn’t feel like making a full-sized carrot cake, and I was worried that carrot muffins would be too fluffy to hold up in the pops. 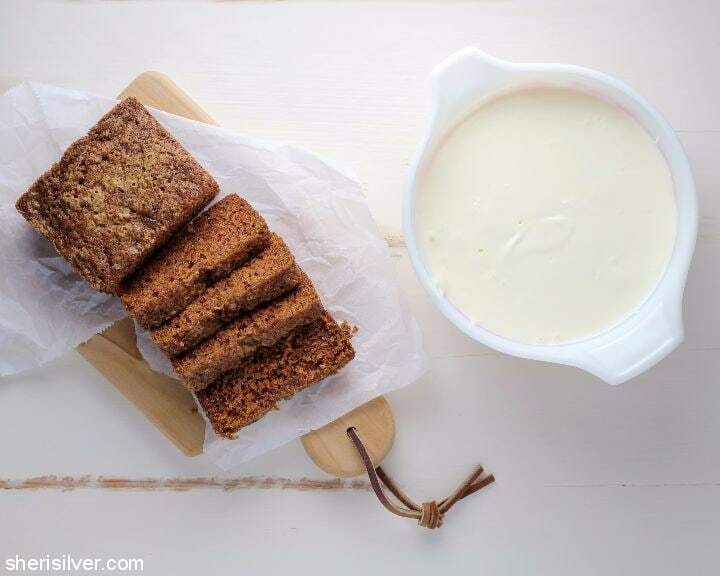 So I searched for a small-scale recipe and came upon Tracy’s beautiful blog – and this recipe. There was even just enough left over for nibbling. As for the end result? The cream cheese flavor was strong with this one (#starwarsobsessedfamily), and perfectly complemented the chunks of carrot cake scattered throughout the pop. I need to start writing things down…. Oh – and if you’re wondering if the cake pieces get rock hard in the freezer, the answer is “no”! The cake stays soft and tender, without absorbing any of the cream cheese base. Pre-heat the oven to 350 degrees – grease an 8″ x 4″ loaf pan and line the bottom with parchment paper. Whisk the egg in a medium bowl. Whisk in the sugar, followed by the vegetable oil. Whisk in the flour, baking soda, spices and salt. Fold in the grated carrots and pour into your prepared pan. Bake for 25 – 35 minutes, or till a toothpick tests clean. Cool in pan on a wire rack, then remove from pan to cool completely. Cover with plastic wrap and refrigerate till ready to use. Place the cream cheese, sour cream, confectioner’s sugar and milk into a food processor; blend till smooth. 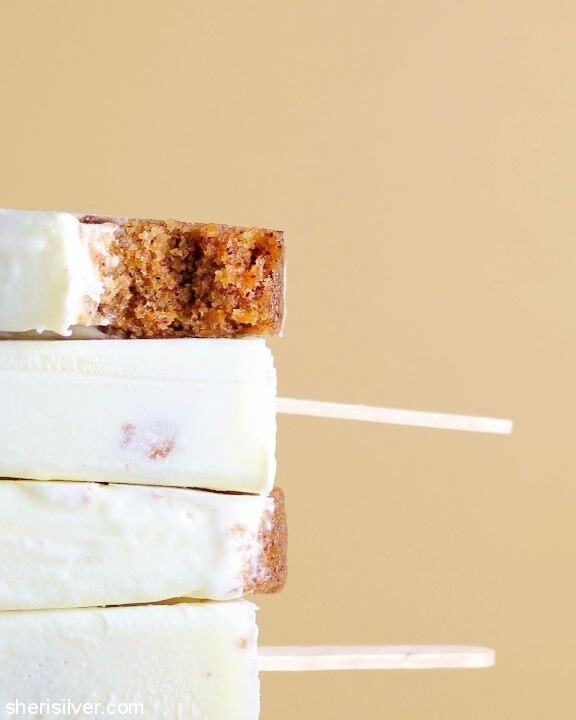 Cut the cake into chunks that will fit nicely in your popsicle molds. Place a few in each mold and then fill with the cheesecake mixture. Rap the molds on the counter to eliminate any air bubbles and allow the mixture to settle and level (top off any molds as needed). Insert your popsicle sticks and freeze overnight. 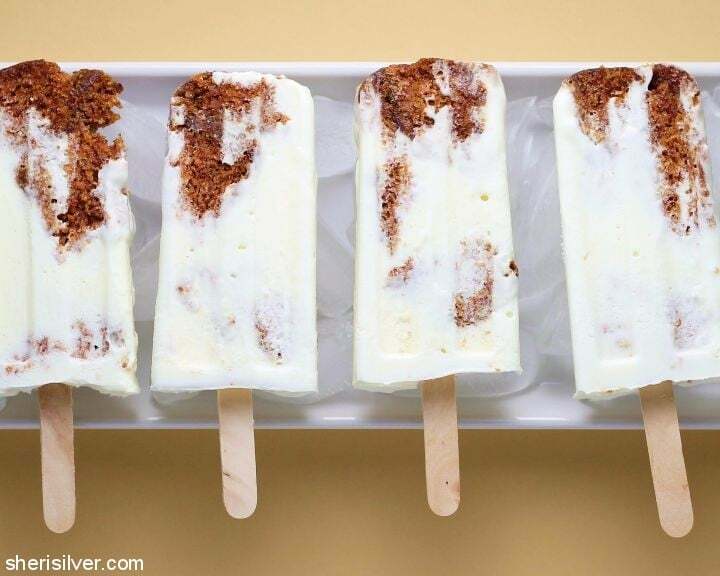 To remove pops, hold molds briefly under hot water. Return to freezer till ready to serve. Want more popsicles? Check out my Pinterest board!